We are discussing whether to continue these gatherings. The CRP process (for more on that see our page on Red Hook Resiliency Planning) is bringing people together on a similar theme. There was no Red Hook Sandy Survivor Gathering in October since there were so many Sandy anniversary events at that time, nor in November since the schedule conflicted with Thanksgiving weekend. Christmas-New Years are conflicts in December. 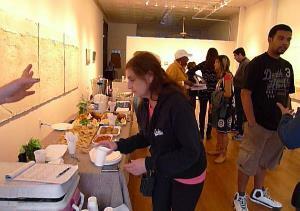 The first such gathering was organized by PortSide NewYork, Realty Collective, Kerry Quade, and Maria Pagano. Red Hook Volunteers helped distribute flyers. PortSide ran the "351" Sandy aid station at that site in November, and Realty Collective, a community-minded real estate brokerage, donated the space for the aid station and set up some of the support meetings there. Kerry Quade has a business in Red Hook which was on a high floor and did not flood, and she was a key player in running the volunteer system in the early days after Sandy. Maria Pagano, is President of the Carroll Gardens Neighborhood Association and a new friend of PortSide. Her involvement is an example of one of the principles PortSide believes Red Hook needs to follow to improve our resiliency to floods: we need friends on high ground nearby, friends who will not flood and who are prepared to help us here in Red Hook. By the Sandy +8 month event, the Visitation Justice Center got involved too, copying flyers and helping distribute them. The Red Hook Volunteers also put up flyers. We encourage you to join in.